Surprises in signal from cosmic dawn also hint at presence of dark matter. Astronomers have for the first time spotted long-sought signals of light from the earliest stars ever to form in the Universe — around 180 million years after the Big Bang. The signal is a fingerprint left on background radiation by hydrogen that absorbed some of this primordial light. The evidence hints that the gas that made up the early Universe was colder than predicted. This, physicists say, is a possible sign of dark matter’s influence. If confirmed, the discovery could mark the first time that dark matter has been detected through anything other than its gravitational effects. Physicists think that the Big Bang, 13.8 billion years ago, generated an ionized plasma, which cooled rapidly as the Universe expanded. After about 370,000 years, this soup began to form neutral hydrogen atoms. Over time — and under gravity’s influence — these clumped together forming stars that ignited. This transition is known as the cosmic dawn (see ‘Dawn’s early light’). “At that point we started to feel a little excitement…” Researchers describe their discovery of a fingerprint from the early Universe. Light from these stars would now be so faint that detecting it with Earth-based telescopes is near impossible. But astronomers have long hoped to see it indirectly: the light would have subtly shifted the behaviour of the hydrogen that once filled the space between stars. This change would have allowed hydrogen gas to absorb radiation from the cosmic microwave background (CMB) — the afterglow of the Big Bang — at a characteristic radio wavelength of 21 centimetres, which leaves a dip in the intensity of the CMB. Radiation from this period arrives stretched out by the expansion of the Universe, meaning the band in which the signal was found gives away its age. This allowed the team to date the latest onset of the cosmic dawn to 180 million years after the Big Bang. The signal’s disappearance gives away a second milestone — when more-energetic X-rays from the deaths of the first stars raised the temperature of the gas and turned off the signal. 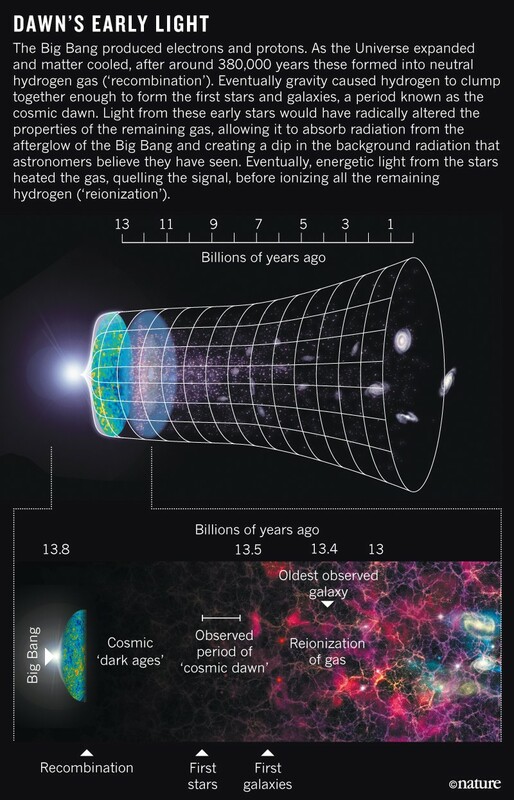 Bowman’s team puts that time around 250 million years after the Big Bang. Understanding these primordial stars is important not only because they shaped the matter around them, but also because their explosive deaths created the soup of heavier elements, such as carbon and oxygen, from which later stars formed, says Bowman. “If we really want to understand the cosmic ladder of our origins, this is a critical step to understand,” he says. While the signal appeared at an expected frequency, its strength was utterly unexpected, says Rennan Barkana, a cosmologist at Tel Aviv University in Israel. “I was actually quite amazed,” says Barkana, who has published a second, related paper in Nature2. He says the strength suggests that either there was more radiation than expected in the cosmic dawn, or the gas was cooler than predicted. Both would be “very strange and unexpected”, he says. The only explanation that makes sense to Barkana is that the gas was cooled by something. That points to dark matter, he says, which theories suggest should have been cold in the cosmic dawn. The results also suggest dark matter should be lighter than the prevailing theory indicates, says Barkana. This could help to explain why physicists have failed to observe dark matter directly, in experiments stretching over decades. If that’s true, we have to design new kinds of experiments to see it, he adds. For now, the cosmic-dawn signal is tentative. But other experiments are lined up to investigate it. Most radio astronomers had been looking for other hydrogen signals from a later period in the Universe’s history. 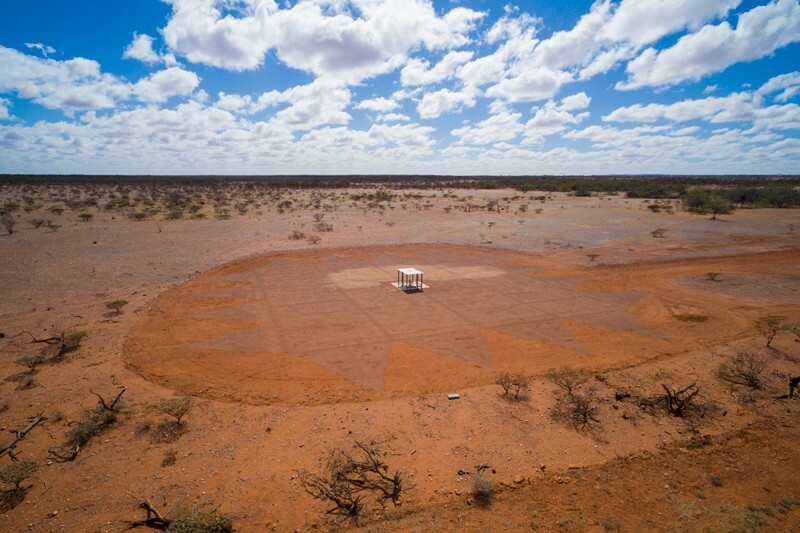 One such experiment in development, the Hydrogen Epoch of Reionization Array, an international radio-telescope project based in South Africa’s Karoo desert, is now being adapted to detect signals at the wavelengths explored by Bowman’s team. He hopes that it could replicate his results during the next few years. Other experiments, such as LOFAR (Low-Frequency Array), a large system of radio antennas spread over five European countries, should be able to go a step further and map how the intensity of the signal fluctuates across the sky. And if the cause of the strong signal is dark matter, that should be visible as a distinctive pattern. “We’re eager for another instrument to confirm it,” says Bowman. Read the related News & Views article: ‘A surprising chill before the cosmic dawn’. Bowman, J. D., Rogers, A. E. E., Monsalve, R. A., Mozdzen, T. J. & Mahesh, N. Nature 555, 67–70 (2018). Barkana, R. Nature 555, 71–74 (2018).